6-Banner Sunday is Inside the Hall’s weekly newsletter in partnership with The Assembly Call. 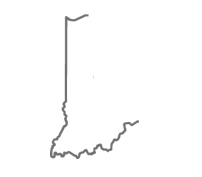 More than 5,800 Indiana fans receive the newsletter each week. In addition to appearing each week on the site, you can also opt to receive 6-Banner Sunday by email. A form to subscribe via email is available at the bottom of this week’s 6-Banner Sunday. Another offseason edition of Six Banner Sunday means basketball season is one week closer, and the excitement for a new year becomes more palpable with each passing day. This week, Indiana picked up an in-state recruit, inched closer to nabbing another, and learned start times and TV networks for the upcoming season. • What can we expect from Michigan and Michigan State this year? The four-star recruit announced on Thursday that he will play his college ball at Indiana, marking another big in-state recruiting win for Archie Miller and the Hoosiers. 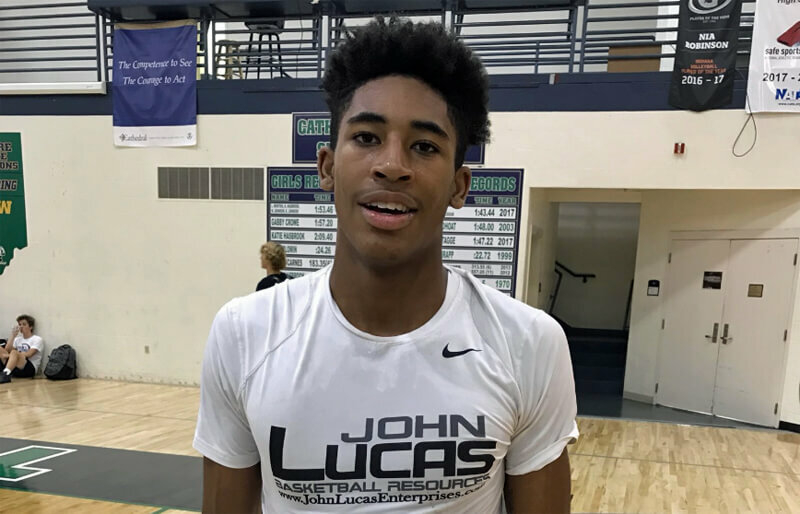 Franklin, a 6-foot-4 guard, is a senior at Cathedral High School in Indianapolis whose options included Butler, Xavier, Louisville, and, most notably, Purdue. After Franklin’s commitment, friend and Purdue commit Isaiah Thompson tweeted his congratulations. Miller has already won over four in-state high school recruits in his first year at IU, holding true to the words he spoke at his introductory press conference in 2017. “We have to dedicate ourselves to the high school coaches in this state, the high school talent in this state, the grassroots programs in this state, and they must feel like they’re being dominated by Indiana University,” Miller said when he was introduced. In fitting with Miller’s style, Franklin can play at either guard spot and actually began his high school career as a forward. His shooting stroke pops on tape, and while he only shot just 29 percent from deep in 21 EYBL games last summer, his form inspires confidence that he could develop into a knockdown threat. Franklin will enter a deep rotation of guards at IU, even if Romeo Langford bolts for the NBA after one season. At the moment, it appears likely that Devonte Green will stay for a fourth season and Al Durham for a third. Barring an unforeseen breakout or disappointment, Robert Phinisee will be on the roster in 2019 as well. Still, Franklin’s ability to play on or off the ball should increase his room for opportunity, and having him in the fold bodes well for Indiana’s recruiting efforts moving forward. On this week’s edition of Assembly Call Radio, we discussed the big picture impact of Franklin’s commitment and provided a detailed scouting report of what he brings as a player. The Big Ten announced start times and TV destinations for conference games Thursday. Hoosier Hysteria will begin at 4 p.m. on September 29, and the season will tip off at 6:30 on November 6 against Chicago State. The first conference game of the season will start at 5 p.m. on December 1 against Northwestern, and the Duke game is slated for 9:30 p.m. on November 27 on ESPN. IU’s games will primarily be broadcast on BTN (10 games), FS1 (six) and ESPN (six), but FOX and CBS will also carry three Indiana games each next season. Every game has been assigned a network except for IU’s contests with Marquette (November 14) and Arkansas (November 18). Trendon Watford will meet with Indiana, Vanderbilt, Kansas, and TCU at his high school in Alabama, according to Adam Zagoria of the New York Times and SportsNet New York. Trayce Jackson-Davis, a five-star recruit from Greenwood, IN, took his official visit to Iowa this weekend. He has also canceled his visit to Purdue, per Matthew Bain of Hawk Central, in order to focus chiefly on his final list of five schools. Indiana also offered a scholarship to Khristian Lander, a 2021 guard from Evansville. Lander announced the news Saturday via Twitter. He is one of the top point guard prospects in his class, and the highest rated recruit in the state of Indiana for 2021. Registration for the Candy Stripe Classic, an annual 3-on-3 tournament for IU students, opened on Thursday. The tournament, which is in its fifth year of existence, will be played in Simon Skjodt Assembly Hall on September 28 and is open to students aged 18 or older and in good academic standing. Each team must bring at least 30 canned goods to the event in order to qualify, and all donations go to Hoosier Hills Food Bank. The final four teams in the tournament will earn reserved seating at Hoosier Hysteria. Brenda Tracy, a survivor of sexual assault at Oregon State in 1998, spoke to the IU basketball team on Wednesday to tell her story and address the issue of sexual assault on college campuses. Tracy heads the “Set the Expectation” campaign, which implores coaches to establish with their players that “sexual assault and physical violence are never okay,” per Tracy’s website. The site also includes contracts players and coaches can sign that pledge to help prevent sexual assault among college athletes. What can we expect from Michigan and Michigan State this year? Jerod and Alex discussed the Wolverines and Spartans with The Athletic’s Brendan Quinn on this week’s Podcast on the Brink. Brendan does great work covering both teams, and shares his thoughts on Michigan’s trip to Spain, key players on Michigan and Michigan State, and two of the best coaches in the Big Ten. Read Brendan’s recent piece on the conclusion of two NCAA inquiries into the MSU athletic department here (requires subscription to The Athletic).